Pianist Peter Frankl has been on the international circuit since the 1960s and has been performing with many of the world greatest orchestras and conductors, such as Claudio Abbado, Pierre Boulez, Bernard Haitink, Lorin Maazel, Kurt Masur, Riccardo Muti, Sir Georg Solti and George Szell, among others. 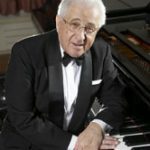 He has appeared in all five continents and performed in Israel on numerous occasions, playing with the Israel Philharmonic Orchestra, the Jerusalem Symphony, the Haifa Symphony and the Israel Chamber Orchestra. He has been a regular participant at international festivals, among them Edinburgh, Cheltenham, Aldeburgh, Verbier, Kuhmo, Santander, Marlboro, Ravinia, Aspen, Norfolk, Yellow Barn and, in London, at the BBC Promenade Concerts. In addition to his solo career, he is equally in demand as a chamber musician, performing with soloists, string quartets and various ensembles. His vast recording output includes the complete piano works by Schumann and Debussy, Brahms’s piano concertos, violin sonatas and trios, Mozart’s piano concertos, the Schumann, Brahms, Dohnanyi, Dvorak and Martinu piano quintets, Hungarian violin sonatas and many solo albums. Peter Frankl is the recipient of the Order of Merit and Middle Cross of the Hungarian Republic. He is on the faculty of Yale University and Honorary Professor of the Liszt Academy in Budapest. He lives in London, UK.